Kawaii anime girl dressed as Santa. I wonder which Rukia-themed avatar you'll use next. Kushina wrote: How old is Zeddy-chan? At the start of the series, Zed is estimated to be 27 years old. I say estimated because nobody knows his exact age, not even him. Great question, Kushi-chan. Goku vs. Zed who is the stronger Super Saiyen? Rukiafan wrote: Goku vs. Zed who is the stronger Super Saiyen? ...wait, why on Junihoshi did I pick Goku?! On another note, Rukia must secretly be a kappa since she loves cucumbers so much. Is Zed as carefree and pure-hearted as Goku? Rukiafan wrote: Is Zed as carefree and pure-hearted as Goku? Well, he's carefree and pure-hearted, so...maybe. @Ragnarok wrote: The Blue Ranger? Nope, it's the protagonist of a series I've been writing and posting right here on WiiWareWave. The Yellow Mushroom Ranger's favourite fictional character! Hey, there should be an episode in which the cast dress as their favourite characters, but the party's interrupted by a monster. I could dress as Zed, you could dress as Rukia, Marioman could dress as Mario, etc. Wait a minute...she has wings! GamerZack7 wrote: Wait a minute...she has wings! Wait a minute...you're wearing a cape! Wait a minute...you have a daisy in your hair! And Rukia looks like...uh...Rukia! Yeah, that's it! This is what Zed's hair reminds me of. Rukiafan wrote: This is what Zed's hair reminds me of. That's the guy who almost burned the Yokomon village to the ground! Haha it does look similar! The biggest Tales of fan in the land! I have yet to play a Tales of... game. GamerZack7 wrote: She has wings. If Zed drinks Red Bull will it give him wings? Nope, but it will make him ridiculously hyperactive and cause his crystal to act up, stretching out his shield and pushing away everybody in a 1000 mile radius! Oh wait...that's what happens if Zed eats Kirby's Candy! Rukia! Rukia! Does whatever a Ru-ki-a! Yeah...I'm not good at songwriting. 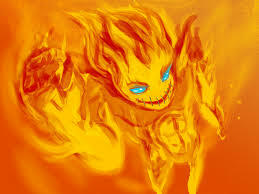 Zed the flaming haired magician. Rukia, the dark-haired warrior from another dimension! Uzumaki-senpai, master kunoichi and Naruto's mother. What is Zed's elemental affinity? I know that he can use spells of different elements, but what is his strongest elemental attribute? Rukiafan wrote: What is Zed's elemental affinity? I know that he can use spells of different elements, but what is his strongest elemental attribute? Well, Zed isn't technically an elemental spellcaster, so that's tough to say. However, people on Junihoshi tend to have one or more elements associated with them, a marker which is readable by an oracle and has no apparent benefit other than determining whether or not an individual is born manifesting that element; Zed's elemental marker is water, one of the few things which could be read from his mind. Great question, Rukia-tomo. Kuchiki Rukia, defender of the Soul Society. Rukiafan wrote: Does Junihoshi celebrate Easter? The Junihoshians don't celebrate Easter as their world's history is different to ours. Terralings, on the other hand, could possibly celebrate something akin to Easter due to Terra's near-identical similarities to our own world. Q: What do Kuchiki Rukia from Bleach and Kapp'n from Animal Crossing have in common? A: They're both obsessed with eating cucumber! Christmas in July is still a few months away, and genuine Christmas isn't for another eight months. Still, it's nice to see somebody in the Christmas spirit for the whole year! The Pokemon generation IV male protagonist. The Cleaning Product Show's female protagonist! Gotta Catch Em' All Pokemon. A wild Pokemon trainer has appeared! What blue hair she has.